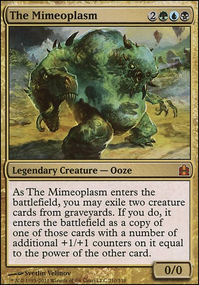 Does Chronozoa create Monster Mash copies via Grusilda? Kumi First off, thanks so much for the feedback! I wanted to play W/U specifically to make the bad matchups less bad; these matchups include Ad Nauseum or Prison decks (decks that run Ensnaring Bridge ). I do see what you’re saying, that 5 counterspells might be too many. I just felt like I wanted to see one to two every game, and 5 felt like the right number. I agree that Dryad Arbor is super important in the Jund/GB Rock matchups, but I assumed that the real key player was Leyline of Sanctity , because, from what I’ve seen of the matchup (and this is super limited experience here, so feel free to take it with a grain of salt), the real danger in the G/B midrange matchup is the discard that they have available. 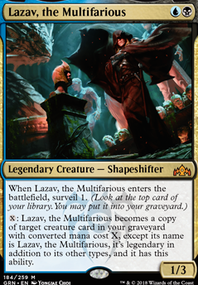 I feel like a turn 1 Thoughtseize or Inquisition of Kozilek taking a hexproof dude would be a much earlier game over. In terms of Liliana of the Veil , my plan was just countering it with Spell Pierce or Stubborn Denial . In terms of Spellskite , I wasn’t even thinking about Burn or Scapeshift, but rather Infect. As Infect seems to me like a garbage-fire of a matchup, I was considering Spellskite as a way to slow them down and build my own clock. Also, Spellskite seems like it would be absolutely busted in the Bogles mirror. But, as neither of these decks are particularly prevalent in the current meta, I see your point. Faster is better. I totally get the Gladecover Scout over Invisible Stalker argument. 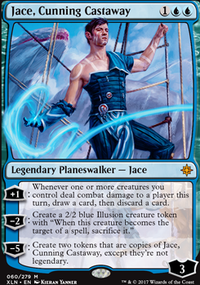 But going down to two Kor Spiritdancer seems strange to me, just because I’ve heard from several Bogles players that, depending on the matchup, it’s straight gas and better to have in the mainboard. I also understand the concern of not having enough Auras, which is why I made the decision to run Curious Obsession over Unstable Mutation . 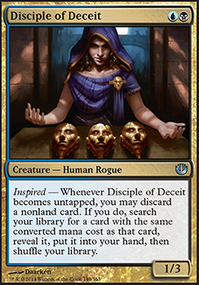 I think I’ll be going up one Curious Obsession to have a full playset; maybe I’ll take out the mainboard Spell Pierce . And...I think that’s about it. Once again, I’d just like to say thanks so much for the feedback. While I do adore W/U, I’m strongly considering switching to Bant Bogles because of the boost I’d get from both Rancor and Gladecover Scout . Oh yeah! One final question: considering how prevalent Humans is in the current meta, should I keep the two Tocatli Honor Guard in the board? It seems like a ridiculous bomb against that deck. Looter il-Kor for Latch Seeker and River Sneak for Invisible Stalker . if its on budget Delver of Secrets Flip but you will need to add more spells. all the enchantments seem redundant Ordeal of Thassa , Singing Bell Strike , Waterknot could be replaced by Curious Obsession , Hands of Binding , Hidden Strings or spells like Vapor Snag , Boomerang , etc. Hall of Triumph might be too slow and you can only have one at a time. if you add black to the mix you could have Inkfathom Witch for a bit more reach and better removal plus a few revival cards like Undying Evil and Demonic Vigor , and hand disruption. and having a 4 of Rune Snag will probably help you too, to stop the opponent killing your creatures or getting a threat. that all i got, i think, good luck with the brew. Thanks, I had Invisible Stalker in the original but replaced it with Thrummingbird . 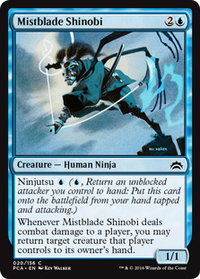 I prefer the early game damage provided by Mist-Cloaked Herald . I love the idea of Serum Visions ! First of all, I love Thrummingbird and Fate Transfer here - those are two awesome cards that see so little play. Something like Heroic Intervention might be good to protect all the counters you're moving. Either that or some counterspell option like Mana Leak or Negate . Good thing the sideboard is wide open! 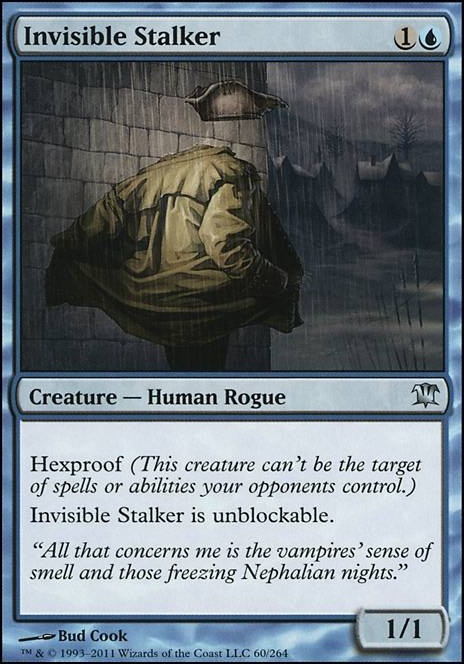 Perhaps Invisible Stalker would be better than Mist-Cloaked Herald ? I think Harmonize might be more useful than Explore - after all, there's only 20 lands here, so the odds of getting the ramp effect are thin. For les mana, Serum Visions or even Opt would probably be more useful, too. Invisible Stalker is a great one.